The GM Contamination Register database has been run by Genewatch and Greenpeace for about ten years and contains cases dating from 1997 to the end of 2013 . The authors of a new paper, published in the International Journal of Food Contamination, analysed the 400 or so cases in the database by crop and country . GM rice accounts for about a third of contamination cases, despite the fact there is officially no GM rice grown anywhere in the world. The authors suggest this high level might be related to the routine testing of imports of GM rice at national borders. The highest rates of contamination are in imported foodstuffs to Germany, but this is probably because that country does a lot of testing. They also focused on cases of contamination arising from unauthorised GM crops: those without any authorisation for commercial growing anywhere in the world. Nine cases were discovered of GM contamination of these unauthorised (non-commercialised) GM crops that haven’t undergone any environmental or food safety analysis. The authors argue that once GM contamination has happened, it can be difficult to contain. It is not only the GM contamination itself (cross-pollination, mix-ups, etc.) that contributes to the number of cases but also the testing regime (both routine and targeted). The paper concludes that for perhaps all experimental GMOs, there is no overall protocol for testing available, making detection of any GM contamination difficult, if not impossible. Don Westfall, biotech industry consultant and vice-president of Promar International some 13 years ago, was quoted by the Toronto Star on 9 January 2001 as saying that the hope of the GM industry is that over time the market is so flooded with GM organisms that there’s nothing you can do about it; you just sort of surrender. It is not just a vague hope, however. It’s an intentional, criminal strategy by the industry. Genetically engineered wheat is not approved to be grown for commercial use in the US or anywhere else in the world. Yet last year, the US Department of Agriculture (USDA) announced that unapproved GE wheat had been found growing in an Oregon wheat field. Since 1994, Monsanto has conducted 279 field trials of RoundUp Ready wheat over more than 4,000 acres of land in 16 US states . The USDA has admitted that Monsanto’s GMO experiments from 1998 to 2005 were held in open wheat fields. The genetically engineered wheat escaped and found its way into commercial wheat fields in Oregon (and possibly 15 other states), causing self-replicating genetic pollution that now taints the entire US wheat industry. Prior to this, in 2006, the USDA granted marketing approval of genetically-engineered Liberty Link 601 of Bayer CropScience. 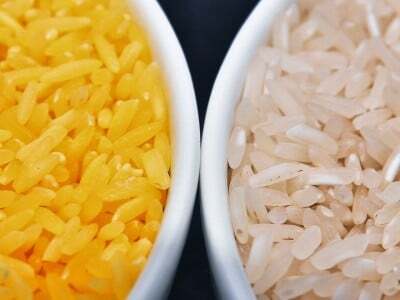 (GE) rice variety following its illegal contamination of the food supply and rice exports . The USDA effectively sanctioned an ‘approval-by-contamination’ policy. In 2005, biologist Pushpa Bhargava alleged that there were reports that unapproved varieties of several genetically modified crops were being sold to farmers in India. And Arun Shrivasatava wrote in 2008 that illegal genetically modified okra had been planted in India and poor farmers had been offered lucrative deals to plant ‘special seed’ of all sorts of vegetables . He asks: who knows at how many places illegal genetically engineered rice have been planted? The story of open air trials of GM crops in India is a story of blatant violations of biosafety norms, hasty approvals, a lack of monitoring abilities, general apathy towards the hazards of contamination and a lack of institutional oversight mechanisms . Concerns have also been expressed in Europe over the contamination of basmati rice exported by India . Just this week, the West Bengal government says it had received information regarding “infiltration” of commercial seeds of GM Bt brinjal from Bangladesh . Bangladesh has gone ahead with the commercial release of the GM vegetable Bt-Brinjal – a variant engineered by inserting a gene from soil bacterium Bacillus thuringiensis that produces an insecticidal toxin. According to the GMWatch website, if this has occurred, it will follow the time-honoured GMO industry tactic of “contaminate first and push for regulatory authorisation afterwards”. Bt brinjal has never undergone independent safety testing but the industry’s own tests show it is toxic [9,10]. In India, the previous government had ordered a freeze on field trials of GM food crops but the current government recently gave the go-ahead to field trials of two varieties of GM brinjal and mustard. Last year, a group of scientists and NGOs protested in Kolkata and elsewhere against the introduction of transgenic brinjal in Bangladesh – a centre for origin and diversity of the vegetable – as it would give rise to contamination of the crop in India. There concerns are now being validated. As has been shown elsewhere, once the GM genie is out of the bottle, there may well be no going back.